Original layout of article on page 66. 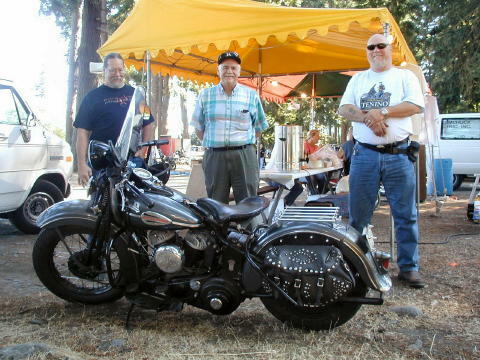 Tenino, WASH., Aug 16-17 — For 23 years, the Evergreen Chapter of the Antique Motorcycle Club of America has held a camp out and swap meet. 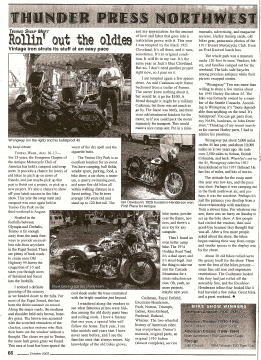 It provides a chance for lovers of old bikers to catch up on news of friends, and just maybe pick up that part to finish out a project, or pick up a new project. It's also a chance to show off your latest success in the bike show. This year the swap meet and camp out was once again held at Tenino City Park in the third weekend in August. Nestled in the foothills between Olympia and Chehalis, Tenino is far enough away from the main freeways to provide an excellent ride from anywhere in Puget Sound. There are plenty of back roads to cruise once Old Highway 99 leaves the congestion of I-5 and takes you through acres of farm land and forest into the foothills. I noticed a definite greening of the scenery as we headed closer to the hills. For most of Puget Sound, this has been the driest summer on record. Along the major roads, the medians and shoulder held only brown, bone-dry grass. The brown was accented with the scorched reminders of the clueless, careless morons who flick their butts out the window without a thought. The closer we got to Tenino, the more lush green grass we found. This area at least has been spared the worst of the dry spell and the cigarette butts. The Tenino City Park is an excellent location for an event. You have camping, ball fields, vendor space, parking, food, a bike show, a car show, a museum, a quarry swimming pool, and some fine old bikes all within walking distance in a forest setting. The fir trees average 100 years old and stand up to 120 feet tall. The cool shade under the trees contrasted with the sunshine just beyond. I wandered along the vendors to see what fabulous prizes were hidden among the old dusty parts bins and rolling stock. I have a fantasy that one year, a special bike will follow me home. Each year I see bike models and years that I have never seen before, and I see the familiar ones that always return. My knowledge of old bikes grows, and my appreciation for the amount of love and labor that goes into a restoration grows with it. This year I was tempted by the black 1921 Cleveland. But no, I don't need another project right now, so I pass on it. I am tempted again a few spaces down. An old Cushman-style frame beckoned from a trailer of frames. The owner knew nothing about it, but would let it go for $100. A friend thought it might be a military Cushman, but there was not much to go by. The frame was beefy, and there were odd attachment brackets for the motor, as if you could pack the motor separately for transport. This would make a nice camping unit. Put in a mini-bike motor, powder coat the frame, new tires, and there's a nice toy for any campsite. Then I found an even better camp bike. The 1974 Hodaka Road Toad. It's a dual sport, and it's street-legal. Just the thing to take me into the Cascade Mountains for a stress reduction session. Oh, yeah, no more projects. Maybe next year. 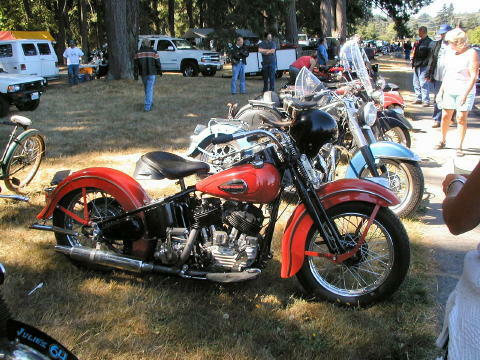 Cushman, Royal Enfield, Excelsior-Henderson, Puch, Norton, Triumph, Indian, Knucklehead, Panhead, Flathead, Whizzer. The two-wheeled history of American rides was everywhere. Owner's manuals, original parts, an original 1910 Indian(almost complete), service manuals, advertising, and magazine reviews. Harley trading cards, old biker gear, panoramic photos of the 1917 Everett Motorcycle Club. Even an Evel Knievel lunch box. The whole park was a museum under 120-foot fir trees. Vendors bikers, and families camped out for the weekend. The kids rode bicycles among priceless antiques while their parents swapped stories. "Wrongway" Tim was more that willing to share a few war stories about his 1945 Harley-Davidson 45. 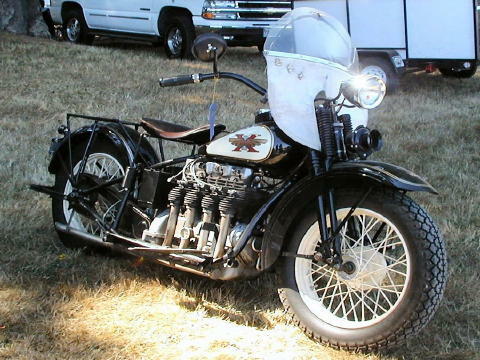 The bike was formerly owned by a member of the Seattle Cossacks. According to Wrongway, it's "more dependable than anything on the road. It's bulletproof. You can get parts from any NAPA, hardware, or John Deere store." Thinking of my recent search for current Harley parts, I had to admire his priorities. Wrongway put about 5,000 miles on his 45 last year, and about 10,000 miles two years ago. He rode over 2,500 miles to Nelson, British Columbia, and back. When he's not on the 45, Wrongway rides his 1937 Knucklehead or his 1937 Flathead. He has lots of miles, and lots of stories. The attitude for the swap meet this year was low-key, and the pace was slow. Perhaps it was camping out in the fresh northwest air, and perhaps it was the sunshine. Perhaps it's just the patience you develop from a close relationship with machines from a slower time. For whatever reason, there was no hurry on Sunday to set up the bike show. A few people had circled the vendors, then said good-bye because they thought that was all. After a few more people asked about the show, the bikes began making their way from camps and vendors spaces t the display area by the street. About 20 old bikes rolled out to the grassy knoll for the show. These were the best of the bikes present — some fine old iron and impressive restorations. The Cushmans looked like they had just rolled off the assembly line, and the Excelsior-Henderson inline-four looked like it had traveled a few miles. Great bikes, and a great weekend.